Consider the carrot. The baby carrot, to be precise. A nutritious, wholesome, feel-good snack you can feel smug about eating, what with its minimal calories and healthy dose of good-for-you beta-carotene. And sure, they’re good for you, but the truth is, they’re just not that interesting, are they? I mean, carrots, right? They’ve been around for 2000 years, they’re not trendy or hip like ramps or kale, or whatever other produce happens to be taking its star turn this year; they’re not really unique or special in any way. So, what if it was your task to “brand” them? 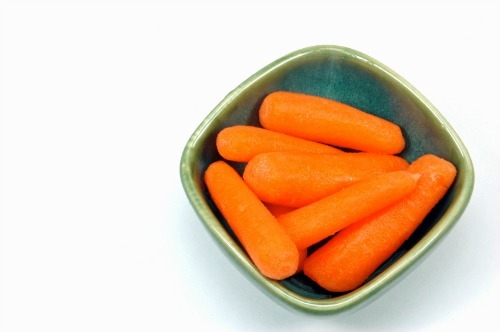 What if you had to come up with a way to position baby carrots so they could compete with, say, cheetohs, potato chips or other junk food as a snack alternative? Maybe you’d think, well, let’s promote their health benefits, that’ll do it! Unfortunately, that line of thinking happens not to work all that well. Even though print and online publications have been touting the joys and benefits of eating fruits and vegetables for years, not to mention many dozens of stories appearing on TV about the dangers of unhealthy eating, produce still has trouble competing for our shopping dollars, and per capita consumption isn’t up. What’s a carrot seller to do? And what’s the point of all this talk about carrots, anyway? My point, and I do have one, is that with enough creativity and resourcefulness, you can uncover the benefits and bring out the personality of any boring old thing to make it interesting and appealing to your audience, as I talked about previously here. Bolthouse Farms did this with carrots a few years ago. And if you can do it for carrots, you can do it for your creative products and services. A few years ago, Jeffrey Dunn, President and CEO of Bolthouse Farms, which grows and processes more than a billion pounds of carrots a year, was shopping for an ad agency to help create a campaign around baby carrots. Bolthouse had never marketed its carrots before, but sales were down, so Dunn decided to shake things up and get creative. But he didn’t want to appeal to smarts and responsibility as in, “eat carrots because they’re good for you,” he wanted to market his company’s baby carrots in a different way. He knew that pitting the health benefits of the cute veggie against the perils of eating junk food wasn’t going to cut it. Instead he wanted something funny and emotional that appealed to impulse snacking. Enter ad agency Crispin Porter + Bogusky. Instead of pitching a campaign centered around the health benefits of carrots, Crispin proposed aligning the baby carrot with junk food. You can read more about the whole she-bang in the fabulous article in Fast Company, “How Carrots Became the New Junk Food.” And check out the Bolthouse Farms website here for a great example of how to position with personality in order to stand out in your niche. I don’t know if it’s because I once worked for an ad agency and I appreciate a killer creative marketing campaign when I see one, but I haven’t been able to get the Baby Carrots story out of my head since I first heard about it late last year. Think about how Bolthouse Farms went against the standard approach in this campaign by deciding not to use a health benefits approach, instead aligning themselves with junk food. How can you apply this kind of creative thinking to your own marketing? Consider how Bolthouse uses personality to transform baby carrots from a healthy, but boring vegetable into a hip, crave-able snack. Are there ways you can do this with your creative products and services? Love the Bolthouse Farm website! Nothing like “injecting” a bit of personality to improve your health! I am learning!!! I agree! We all already know we need to eat our veggies, so adding some personality to the marketing mix and doing something really different by NOT focusing on the health benefits of carrots is what makes this Bolthouse campaign successful. Wow! I had not seen that before. Wonderful and inspiring. I am going to have to go crunch some carrots with my thinking cap on – I make art and it is pretty yummy already but how to shake it up…. Hey Amantha, thank for stopping by to comment! Thanks for this excellent article. I really liked the carrot company website. I joined their page on Facebook. I know, they’re cool, right? I just love the whole company “persona” – very effective. Baby carrots? Who’d a thunk it?!?!? You go you baby carrots you. Great article Kimberly. Have a stupendous day! Yeah, baby carrots, who knew? Ha, I don’t even like carrots and this campaign made me want to buy some!